CARGIN booked their place in the Antrim SFC final in the most dramatic manner possible with a one-point win over old rivals St Gall’s at Creggan on Saturday evening. 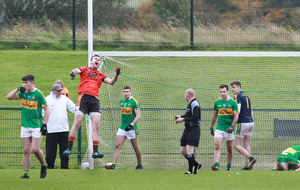 With the last kick of an epic encounter, Cargin’s Tomás McCann scored the goal his side needed to progress at the expense of a crestfallen St Gall’s outfit. This truly was a game for the ages as the two teams who have dominated club football in the county for the last two decades played out a thriller in front of a huge crowd at Creggan. Indeed, throw-in was delayed by 15 minutes such was the demand for standing room and those in attendance were treated to a thriller. St Gall’s plundered two goals in each half to take control of proceedings, but Cargin’s never-day-die attitude saw them battle back each time. Both side’s were indebted to their full-forwards with Kevin Niblock and Michael Magill leading the line superbly for their respective teams. Niblock delivered a virtuoso performance for the Milltown Row side and was desperately unlucky to find himself on the losing side. 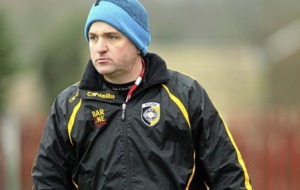 The former Antrim skipper played a hand in the game’s opening goal as he took a return pass from Sean Kelly before setting up Michael Pollock to fire past John McNabb to put St Gall’s 1-1 to 0-2 up after eight minutes. Tony Scullion replied at the other end with a fine point, but St Gall’s bagged their second major on 10 minutes with CJ McGourty rounding McNabb to finish off another slick counter attack from the West Belfast men. 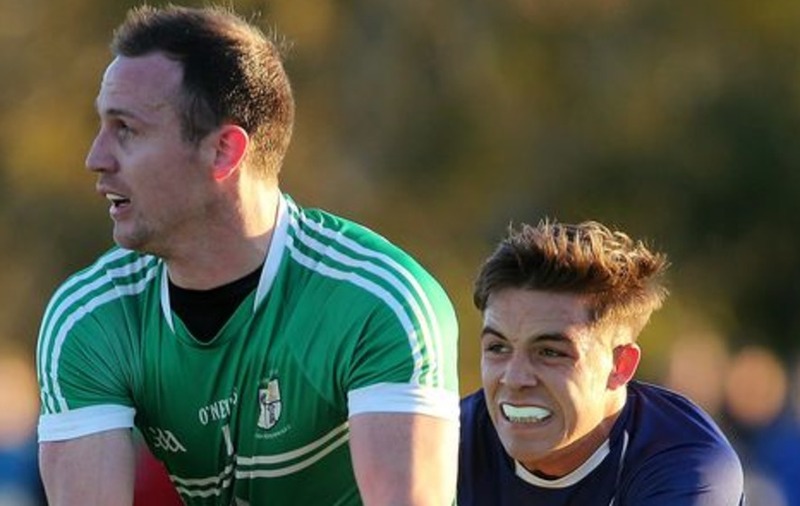 Points from Jamie Gribbin, Magill and a McCann free ensured that Cargin kept tabs on their opponents and a further three points from the impressive McCann nudged the Toome men into a one-point lead with McGourty converting a free for St Gall’s. In first half injury-time, McGourty landed a stunning free from out on the far wing in front of the Cargin dugout to leave the sides level, 2-5 to 0-11 at the interval. St Gall’s regained control of proceedings immediately after the restart with back-to-back goals. 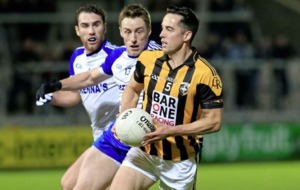 A deft pass from McGourty to Niall O’Neill created the chance for Niblock to cut in for his side’s third goal just 50 seconds into the half and Cargin were left reeling by the concession of a fourth minutes later. This time it was Kieran McGourty who blasted into the net after pouncing on a break and wrong-footing McNabb with a crisp first-time strike off the ground. Leading 4-5 to 0-11 on 34 minutes, St Gall’s were in a strong position to push on, but they had struggled to curtail Magill at full-forward with both Andy McClean and Conor Burke having spells on Cargin’s target man. Magill drew a free which McCann converted before he hit two points in quick succession to kick-start Cargin’s revival. Scullion was fortunate to avoid a black card for taking down Tomás Ó Ciaráin when the defender was charging through the middle, and McGourty converted the free to keep St Gall’s four clear inside the closing 10 minutes. Ciaran Bradley and Scullion landed points for Cargin either side of a Pollock free before what was a remarkable end to an unforgettable clash. Damian Cassidy’s men drew level with two minutes of normal time remaining after Bradley’s attempted shot fell to Magill at the near post and the full-forward raised his fist to the ball to keep it in play. The ball broke kindly for Gribbin, who finished with aplomb to tie the game at 1-17 to 4-8. St Gall’s hit back with two classy scores, the first from the industrious Eoghan McCabe and the second from the boot of Pollock following yet another assist from Niblock. It would have been enough to win any other game, but this wasn’t any other game. Cargin engineered another attack and they felt they should have been allowed to continue with the advantage as Gribbin was in possession close to goal, but referee Sean Laverty called play back for a foul on Michael McCann. The elder McCann was fouled a second time on the 14-yard line moments later and Tomás lined up the shot. This time it was win-or-bust. With 65 minutes played and all but two St Gall’s players camped along Chris Kerr’s goalmouth, McCann unleashed a thunderous drive into the roof of the net to spark scenes of jubilation among the Cargin faithful. Cargin: J McNabb; D McKeever, K O’Boyle, J Laverty; T Scullion (0-2), J Crozier, M Clarke; G McCann, K McShane; C Bradley (0-1), M McCann, J Gribbin (1-2); T McCann (1-8, 1-6 frees), M Magill (0-4), E McGrogan; Subs: G McCorley for O’Boyle (18), J Carron for Clarke (47), K Close for McGrogan (53), D Johnston for McKeever (54). 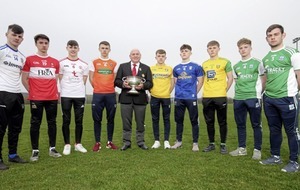 St Gall’s: C Kerr; T Ó Ciaráin, A McClean, C Brady; J McGreevy, C Burke, S Kelly; A Gallagher, M Pollock (1-2, 0-1 free); N O’Neill, K McGourty (1-0), E McCabe (0-2); T O’Neill, CJ McGourty (1-6, 0-6 frees), K Niblock (1-0); Subs: B Bradley for Kelly (55), C Stinton for O’Neill (55).